Feminism is outdated. Believing in an ideology that has long outgrown its historical context damages the future of our society, distracts us from the most pressing issues and sets up problems for today. Feminism persists because it is an ideology that evolved to promote the interests of the privileged. For example, the so-called gender pay gap is only significant at the higher economic deciles where women have husbands to support them anyway. It is not a significant feature of lower economic groups. What is important to them is family and home. A huge amount of attention goes to the number of women in boardrooms. This affects a tiny number of women and is completely irrelevant to how the rest of us live. The focus on the number of women in Parliament devalues the importance of grassroots politics and distracts from inequalities of race, disability or class. As a product of elite concerns feminism has preoccupied itself with issues of power and status. And distracted us from real sources of human suffering and pain. But it is the real injustices and inequalities which should be driving our policies forward. Not the cosmetic disadvantages of the privileged few. Rather than looking at workplace status or sexist remarks, we should focus on suicide and rough sleeping, children in care, unfair custodial sentencing, deaths in the workplace, forced separation from our children, being a victim of violence, rates of alcohol and drug abuse. The trouble is that when we turn to actual suffering, it is not women who are victims but men. But those of us who have skin in the game know that male suffering is a valueless currency. The male empathy gap, male gender blindness or – whatever you like to call it – is simply too strong. So if we want to move forward we need to show how male disadvantage is deeply destructive of a cohesive and healthy society with very negative implications for women and children as well as men. So let’s look at education. Feminism emerged at a time when girls were lagging. It still seeks out scraps of female disadvantage – apparently self-esteem. It hasn’t caught up with the changes. Now boys should be at the centre of everyone’s concerns. Differences in educational attainment start early. Boys are more likely to be identified with ADHD and special needs. Boys account for 80 per cent of permanent school exclusions. By the end of primary education, 22 per cent of boys achieve level 5 compared to 27 per cent of girls. Girls are over 20 per cent more likely to achieve 5 GCSEs. Twenty per cent fewer boys take A levels. This leads to fewer male entrants to higher education. 94,000 fewer at the last count. The gap is widest among the poorest; 51 per cent more women make it to university. Women overall obtain 35 per cent more degrees. Men’s lower levels of education have a detrimental impact on employment opportunities – it is not until women start taking time out to have children that they actually earn less than men. Up to the age of 30 women’s median hourly rate is 8 per cent higher. By the time men reach 30 they have earned £12,500 less than their fathers. 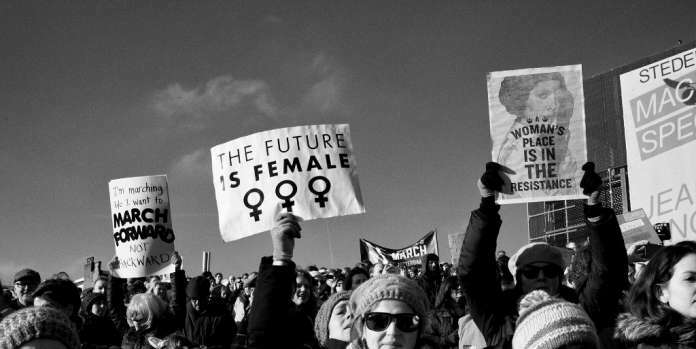 With feminism’s constant focus on women, the situation is likely to get worse. Unemployment and low wages have become a firmly embedded characteristic of less educated men. And this is damaging for all. Men’s low earnings have a direct and significant impact on rates of marriage. Where marriage once provided a source of security for the disadvantaged, it has now become the preserve of the privileged. Poorer mothers do better if they go down the route of state benefits – if they stayed with their partner, very serious levels of poverty could result. This means poorer families cannot afford to stay together. Either they are single parents or they pretend to go it alone. The result is high levels of instability. Male partners, they come and they go. This is bad for men. The responsibilities of marriage have been shown to reduce risk-taking behaviours, increase hours of work and time spent in the home. Removing the means to get married has had a deleterious effect on men’s behaviour causing social pathology to rise. Mothers too are deprived of a helpmate. Compared to married women they are less happy, have lower incomes, are less likely to live in their own house or be employed. However the worst impact is reserved for the children. They do significantly worse. Even short periods of an unpartnered parent impact on educational attainment, criminal activity and risky behaviour. Poverty and single parenthood vastly increase the likelihood of being in care. The negative consequences are particularly marked for boys. Growing up in a single parent household will have an adverse impact on their psycho social development and educational achievement. They are more likely to engage in delinquent behaviour. Lower levels of health, employment and life satisfaction follow as a result. The lack of attention given to these issues means that the employment and childcare burden of less well-off women goes up. With each generation their poverty and social disadvantage become much more entrenched. And without stable families to support them, opportunities for social mobility among their children also significantly decline. This is a direct result of last century’s feminism so moulded by 1960s women that it became blind to the 21st century’s concerns. Women have long achieved equality of opportunity. We now need to focus on the educational and employment opportunities of males. This would strengthen the family among the less well-off and would increase social mobility and equality. We also need to build stable relationships of trust and interdependency between men and women. With a feminism so focused on toxic masculinity, male violence, and female independence this cannot happen within a feminist framework. We need to look to the future, move beyond feminism and escape feminism’s toxic concerns.